Transcript: Clint Eastwood's Convention Remarks Actor and director Clint Eastwood's address to the Republican National Convention, as delivered. 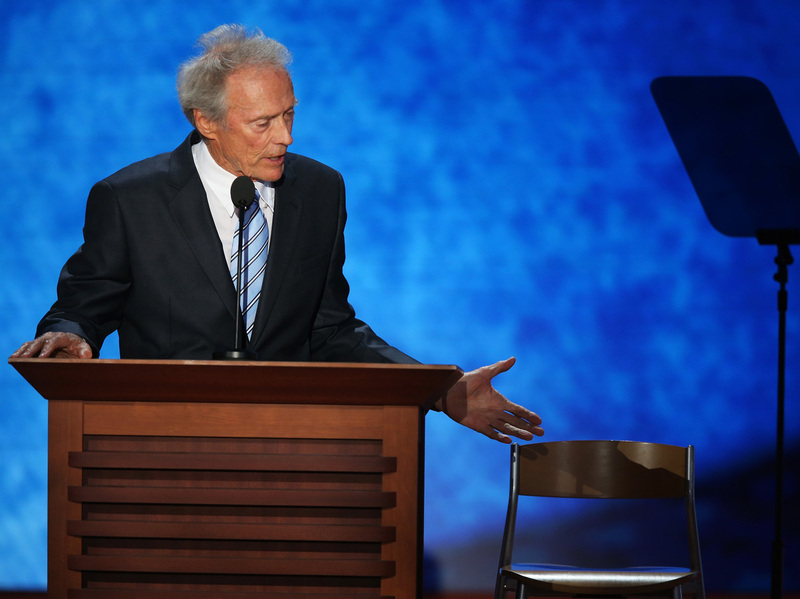 Clint Eastwood speaks at the Republican National Convention on Thursday. I know what you're thinking. You're thinking, what's a movie tradesman doing out here? You know they are all left-wingers out there, left of Lenin. At least that's what people think. But that's not really the case. There's a lot of conservative people, a lot of moderate people, Republicans, Democrats, in Hollywood. It's just that the conservative people by the nature of the word itself play it a little more close to the vest. They don't go around hot-dogging it. So, uh ... But they're there, believe me, they're there. I just think, in fact, some of them around town, I saw Jon Voigt, a lot of people around here in town. So I — so I've got Mr. Obama sitting here. And he's — I just was going to ask him a couple of questions. But, you know, about, I remember three-and-a-half years ago, when Mr. Obama won the election. And though I wasn't a big supporter, I was watching that night when he was having that thing and they were talking about hope and change and they were talking about, yes we can, and it was dark outdoors, and it was nice, and people were lighting candles. And they were saying, you know, I just thought, this is great. Everybody's crying. Oprah was crying. I was even crying. And then finally — I haven't cried that hard since I found out that there's 23 million unemployed people in this country. Now that is something to cry for because that is a disgrace, a national disgrace, and we haven't done enough, obviously — this administration hasn't done enough to cure that. Whatever interest they have is not strong enough, and I think possibly now it may be time for somebody else to come along and solve the problem. So, so, Mr. President, how do you, how do you handle, how do you handle promises that you've made when you were running for election and how do you handle, how do you handle it? I mean, what do you say to people? Do you just — you know — I know — people were wondering. You don't? You don't handle it. Well, I know even some of the people in your own party were very disappointed when you didn't close Gitmo. And I thought, well, closing Gitmo — why close that? We spent so much money on it. But, I thought maybe as an excuse. OK, I thought it was just because somebody had the stupid idea of trying terrorists in downtown New York City. Maybe that was it. I've got to, I've got to hand it to you. I've got to give credit where credit is due. You did finally overrule that finally. And that's so, now we're moving onward. I know, in the, you were against the war in Iraq and that's OK. But you thought the war in Afghanistan was OK.
didn't check with the Russians to see how they did there for 10 years. But we did it, and it was, it's something to be thought about and I think that when we get to maybe — I think you've mentioned something about having a target date for bringing everybody home and you give that target date, and I think Mr. Romney asked the only sensible question. He says, "Why are you giving the date out now? Why don't you just bring them home tomorrow morning?" And I thought — I thought, yeah — there's, I'm not going to shut up. It's my turn. So anyway, we're going to have, we're going to have to have a little chat about that. And then, I just wondered, all these promises and then I wondered about, you know, when the, What? What do you want me to tell Romney? I can't tell him to do that. That. He can't do that to himself. You're crazy. You're absolutely crazy. You're getting as bad as Biden. But I just think that there's much to be done and I think that Mr. Romney and Mr. Ryan are two guys that can come along. See, I never thought it was a good idea for attorneys to be president anyway, because ... Yeah. I think attorneys are so busy. You know, they're always taught to argue everything, and always weigh everything and weigh both sides and they're always, you know, they're always devil's advocating this and bifurcating this and bifurcating that. You know all that stuff. But, I think it is maybe time. What do you think for maybe a businessman? How about that? A stellar businessman. Quote, unquote, a stellar businessman. And I think it's that time. And I think if you just kind of stepped aside and Mr. Romney can kind of take over. You could still use the plane. Though maybe a smaller one. Not that big gas guzzler when you're going around to colleges and talking about student loans and stuff like that. You're an ecological man. Why would you want to drive that truck around? OK, well, anyway. All right, I'm sorry. I can't do that to myself either. But I'd just like to say something, ladies and gentlemen. Something that I think is very important. It is that, you, we, we own this country. Yes, we own it. And it's not you owning it and not politicians owning it. Politicians are employees of ours. And, so, they're just going to come around and beg for votes every few years. It's the same old deal. But I just think that it's important that you realize and that you're the best in the world. And whether you're Democrat or whether you're a Republican or whether you're Libertarian or whatever, you're the best. And we should not ever forget that. And when somebody does not do the job, we got to let 'em go. We don't have to be — what I'm saying, we don't have to be metal masochists and vote for somebody that we don't really even want in office just because they seem to be nice guys or maybe not so nice guys if you look at some of the recent ads going out there. I don't know.